Yesterday was Yom Kippur. Actually, it started yesterday at sundown and goes through sundown today. There are many details about this Jewish holiday but I won’t (mainly because I don’t know them) explain them here. 7. During biblical times, Yom Kippur was the only day that a high priest was allowed to enter the inner sanctum of the Holy Temple of Jerusalem, known as the Holy of Holies. The reason it is listed as number 7 is because it comes from a list on this website. This practice of the high priest being allowed into the Holy of Holies originated with Moses and Aaron in the Old Testament. Leviticus 16 describes the process of how Aaron, the high priest, was to enter the Holy of Holies. 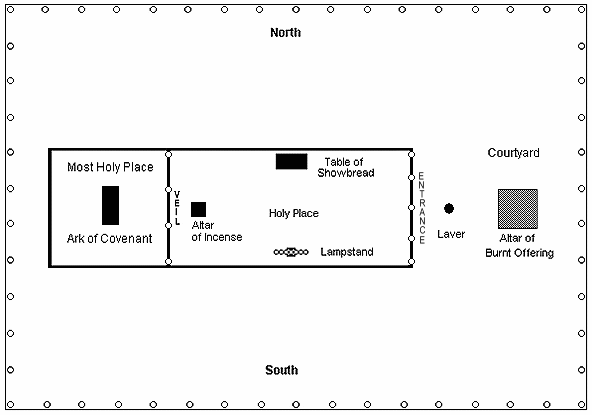 This diagram show the tabernacle that Moses and Aaron would have been using. Between the Holy Place and the Holy of Holies is a curtain. It ran from ceiling to floor and was thick. No light would pass through it. Here is one artist’s rendition. That little room that housed the Ark of the Covenant was completely dark and no one entered into it, ever. Except the high priest once a year on the Day of Atonement, which is Yom Kippur. God told Moses that Aaron would die if he entered whenever he wanted to. Now there was a process. Read Leviticus 16 to get the full picture. I will sum it up for you. One time a year, the high priest would enter the Holy of Holies to receive forgiveness for the sins of the people of Israel. He could only do this if he sprinkles the blood of the sacrifice on the Ark before he comes into the room. Only after the blood was applied could the priest seek God. Without the blood, he would die. Literally. Now transition with me to the present. Here is the state we are in right now. Without the blood, we would die. Figuratively. Our sin has separated us from God. It is like that huge thick curtain is blocking our way to God. And if not dealt with, we are dead. Our spirits are dead to God without the blood and our bodies will die someday as well. What we need is a Divine Transfusion. Our blood is tainted. It is sick, corrupt. We need the blood of Jesus to flow in our veins. Today can be your Day of Atonement. You can receive your Divine Transfusion. If you already have been cleansed by His blood, rejoice and be thankful for His grace and mercy in your life today. Pardon. Have you been enjoying the freedom that comes with being pardoned? Have you ever felt guilty about something? That feeling of having made a mistake is stuck with you. Maybe after some time the feeling fades. But you still know that the guilt is there. But God changed all that. Last week, we were able to see how “one died for all.” God gave Jesus as a sacrifice for us. If you ever wonder why Jesus had to die on the cross, read Leviticus. Perhaps the most dull book in the Bible, Levitcus explains and details all of the sacrifices, festivals, and rituals that the Israelites were supposed to follow. What a bloody mess! Literally everyday, animals were being cut open; their blood being poured out and sprinkled on the furniture in the tabernacle. Some of the animals were eaten by the priests while others were completely consumed on the Altar of Burnt Offerings. Leviticus 17 mentions “the life of every creature is in the blood.” The blood was important. The blood of Jesus bought our pardon. And because we are pardoned, we can have peace. First the pardon and then the peace. Never the other way around. Verse 17 gives us the Pardon. Verse 18 contains the Peace. We need to define reconciliation. Reconciliation is the result of Christ precisely exchanging His righteousness (his blood) for our guilt. If someone is in Christ, that exchange has taken place. That means that you and I stand before God completely free of guilt because our sins have been covered by the blood! Can I end with a math equation? Actually, I was thinking of something considerably more simple. Being guilt free = peace. Once a year then once for all. Pretty awesome. People had told me that you could eat anytime you wanted to while cruising. Really? Anytime? Yes. You could get food literally, anytime of the day or night. My wife and I met some friends on the ship. We ended up hanging out with them most of the week. Around 11:30 or midnight, we would find ourselves at the Cafe Promenade. Pizza. Yep, right out of the oven. Hot pizza. There were desserts and sandwiches as well. But I liked the pizza. It is a lasting memory for me. So it is true. 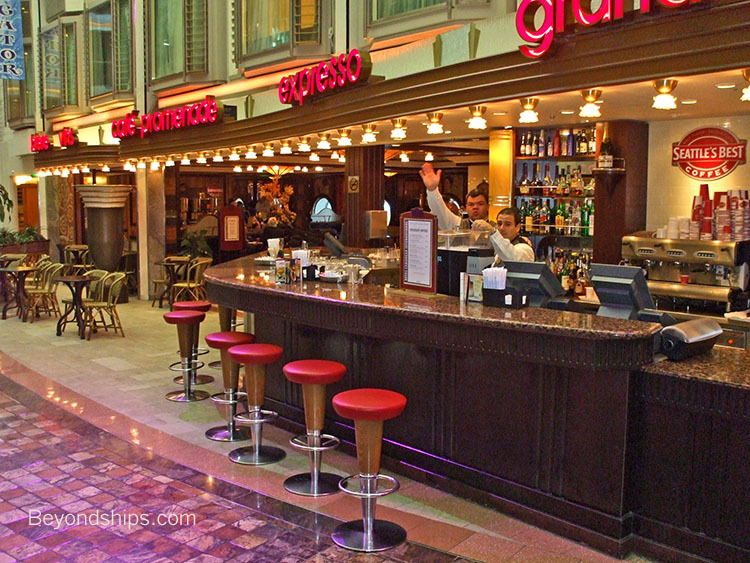 You can get food 24/7 on a cruise ship. Wow. Let me rephrase that last statement. A person has access to food 24/7 on a cruise ship. That word, access, caught my attention. Along with food on a cruise ship, there is something else that we have access to 24/7. The book of Hebrews is one of my favorite books. There are two specific verses that I want to point out. They are both in chapter 9. The book of Hebrews is filled with comparison. In this instance, Christ is being compared to the High Priest of the Old Testament. Verse 7 is talking about the priest. The “he” in verse 12 refers to Christ. Every year, on the Day of Atonement, the high priest would enter the most holy place with animal’s blood to offer sacrifice for the sins of the people. This was God’s way of bringing forgiveness to the people. Once a year. When Jesus was crucified, he took on the role of high priest. However, he did not enter the earthly temple. He entered the heavenly temple. But Jesus had his own blood to bring forgiveness. Once for all. Do you see the difference? And what a difference it is! And because Jesus used his own blood and entered the heavenly temple, eternal redemption (forgiveness) can be obtained! YOU AND I NOW HAVE ACCESS TO GOD. Complete, full, and unhindered access to God. We can be forgiven. Life can now be truly lived because of the access granted to us by Christ. Forgiveness for sins is already been paid for. And being forgiven is far better than pizza at midnight at the Cafe Promenade on the Navigator of the Seas sailing in the Caribbean Sea. Why don’t you try both and see which one you like better? Bon Voyage!